Should the Guyana Elections Commission (GECOM) plan to conduct house-to-house registration in 2019 be abandoned now? This question was posed by Government-nominated Commissioner, Desmond Trotman in response to assertions made by People’s Progressive Commissioner, Bibi Shadick who reportedly stated that GECOM is ready to hold General and Regional Elections in 2019. Those elections were initially scheduled for 2020, but the recent passage of a no-confidence motion against the Government in the National Assembly will see elections being held in March, 2019. “As far as I am aware, there has been no allocation of funds to hold elections in Guyana in 2019,” Trotman has indicated. Trotman expressed the view that it is important to ensure that GECOM holds the elections with a voters list that is cleansed of all of its impurities. In this regard, he stated that the Commission deliberated on and approved the plan to conduct House to House Registration in 2019, to ensure the production of a new and more credible list prior to the holding of the next General and Regional Elections. He said the Secretariat prepared and presented its budgetary estimates for the approval of the Commission accordingly. These Commission approved estimates were later submitted to the Clerk of the National Assembly. The Committee of Supply of the National Assembly approved GECOM’s budget request with the funds allocated to GECOM for the conduct of this House-to-house Registration exercise in 2019. “Should this exercise be abandoned now?” Trotman asked. GECOM has budgeted $3B for the house-to-house exercise. According to Trotman, it is his understanding that Commissioners of GECOM had arrived at such a decision some years ago but funds were not made available for the conduct of the scheduled house-to-house registration, in keeping with the policy to conduct house-to-house registration every seven years. He said that decision was constantly reiterated by GECOM’s Secretariat. 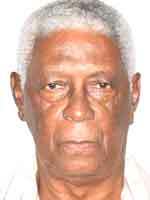 Trotman, who is the most recent Commissioner to be appointed, indicated that his sole interest on the Commission is about ensuring that a level playing field is created to ensure that at the end of the process, the results will be universally accepted as representing the will of all of the people in Guyana. According to Trotman, Shadick deliberately ignored the arguments that have constantly been raised in GECOM’s several plenaries about the validity of the present list. There have been charges that it is an inflated list. “Commissioner Shadick should say why it is they have been arguing at the level of the Commission that the list contains more than thirty thousand names of deceased persons who have departed the scene over a thirty year period and should be expunged prior to any General Elections being held and equate that position to one in which she now seems to have no problem with its size and purity,” Trotman indicated. He also pointed to the need to address the existing senior staff vacancies prior to the holding of the elections. According to Trotman, filling those positions are extremely critical to ensuring that GECOM has the enhanced capacity to conduct the elections, notwithstanding the fact that GECOM was able to successfully conduct the 2018 Local Government Elections (LGE). He noted that PPP Commissioners Robeson Benn and Shadick were not adamant in their decision not to interview available applicants for the positions until the Ethnic Relations Commission (ERC) pronounced, what they hoped and continue to believe will be a favourable decision in keeping with the complaints they made about the employment practices in GECOM. He stated that those positions would have been filled a long time ago. “Let us be clear on one thing, LGEs and General and Regional elections are different types of elections with the results of the latter being more impacting on the life of a country, in this instance, Guyana,” Trotman stated. He stated that the successful conduct of the 2018 LGE is nothing short of a miracle by the Chief Elections Officer (CEO), Keith Lowenfield and his staff.